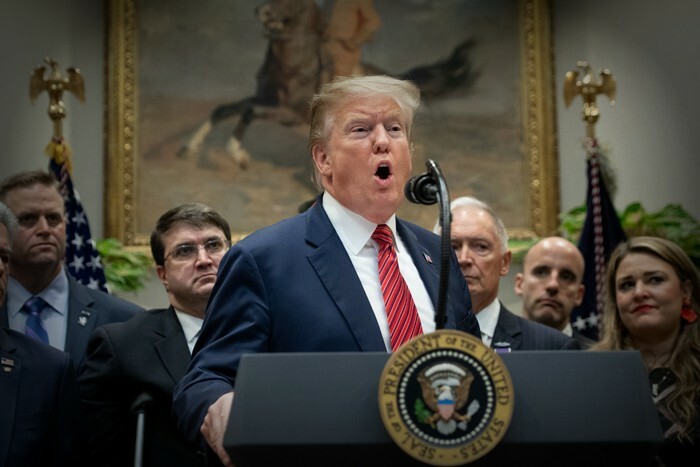 On February 15, 2019, President Trump declared a national emergency in an effort to keep his primary campaign promise of a large, 200-mile long wall along the southern border between the United States and Mexico . Yet again, the President exercised a loophole to assert the executive power of the purse in certain situations. Responses on both sides of the aisle have been mixed, as Democrats have capitulated for the sake of averting a shutdown, and to reaffirm their commitment to national security, in an effort to make up electoral ground ahead of 2020. Recent polls indicate that less than 25% of Republicans in Congress approve of Trump’s arbitrary use of national emergency powers . With lawsuits all but certain to ensue, the courts will have to decide if presidents can subvert the will of the legislature. Trump intends to requisition Department of Defense funds under the aegis of the “immigration crisis,” which the White House has promulgated against all independent analysis indicating otherwise. This has caused an uproar within both the beltway community as well as in legal academia. Divisive policy and the Trump presidency seem to be inseparable and, in a rather predictable fashion, he has bifurcated most national shareholders on executive authority. The vendetta here is executive authority vs. congressional authority. Members of the conservative orthodoxy have come to support an executive that has the ability to operate somewhat independently of congressional pressure. Now that Democrats have captured the House, they are placing immense pressure on the Trump administration to forgo this politically motivated gesture. The president is using the National Emergencies Act of 1974 as a justification for this undertaking . The legal battle over the construction of this wall will certainly create a constitutional conflict due to the statutory powers that the president is granted through this act. This statute gives the president 136 emergency powers with only 13 needing congressional approval, these powers include, but are not limited to, things from utilizing the defense budget for military projects to suspending all laws pertaining to chemical and biological warfare as well as suspending Clean Air Act provisions with the petition of a governor for any military installation. The wide range of authority that this legislation provides the executive is derived from his declaration of a national emergency, whether one actually exists or not is not a criterion. To make matters even more complex there must be a supermajority vote in both houses to successfully veto any exercise of presidential emergency power which, mild Republican defection notwithstanding, is unlikely to happen. Ironically, this legislation was supposed to limit presidential power by specifically enumerating them, I suppose lawmakers of yesteryear did not count on the political tactic of manufacturing crisis to be such a popular in the first world. Halt the growing Trump cult of personality. There are only three possible outcomes to this constitutional conundrum we find ourselves in: 1.) the wall gets built, 2.) the wall doesn’t get built 3.) something in between. The successful completion of the wall, especially with the use of this precedent, would alter the scope of presidential emergency power. If such a maneuver were successful, any future commander in chief would have the ability to declare a national emergency to any policy area he or she wanted to divert funds towards, further politicizing the national purse. If the wall doesn’t come to fruition Trump’s 2020 ambitions may certainly be in jeopardy, and that would close the book on presidential authority. Alternatively, in a rare but unlikely turn of events, both parties may actually abide by what the prescribed budget dictates and diffuse this growing powder keg, but of all the alternatives this is the least likely. The construction of this wall will have more of a substantive symbolic impact rather than fiscal or political. Some of the citizens that live within the border region may be uprooted but, as unfortunate as it is to say, the grand impact will be relatively mild. National security and the reduction of illegal entrants is a political and economic imperative that the nation should be more mindful of, politics aside, but allowing the president to appropriate funds is a slippery slope; third world countries are perpetually left behind in the global economy because of an executive that has direct discretion over the economy. The president does seem to be supported by black letter law in the assertion of these powers, however, that is not going to stop the deluge of lawsuits that will inevitably follow. There is no simple fix here, the optimal course of action would be to utilize only the funds allotted by Congress to increase security measures and make the fiscal priority hiring more border agents. It is important for a president to maintain credibility and carry out campaign promises to his or her constituencies but the negative externalities that stem from such decisions may produce more costs than benefits. The most disconcerting factor about this situation is that actors on both sides of the aisle are diluting an important issue for the sake of political capital. Those in blue believe that the wall is a symbol of racism and tyranny whereas those in red see it as an important measure to protect the security of the nation. This is a political marketing campaign to change the narrative on what this issue is actually about and the focus should be on the power of the executive and not their political motivations for exercising said power. The wall will be a political/psychological test of how the government views the use of executive powers and set the course for either an expansion or restriction of executive authority.